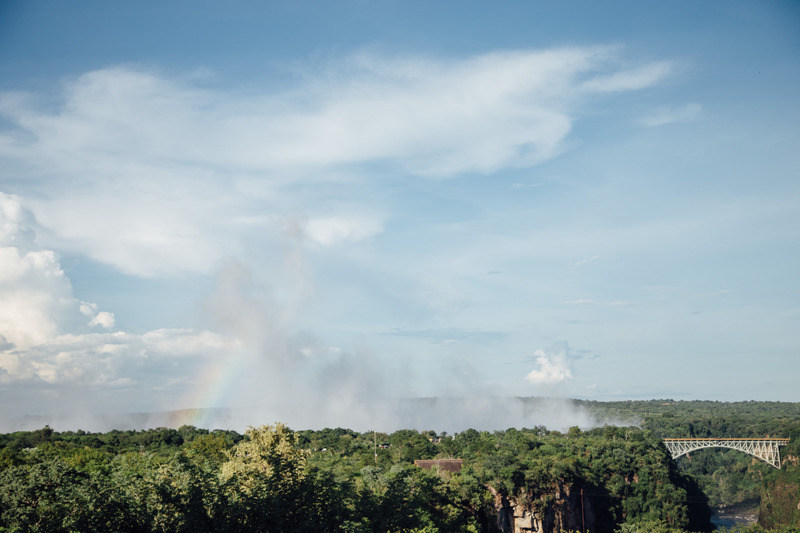 After a lovely few days isolated from humanity we bid farewell to our trusty guide Livingstone and headed off in a van bound directly for Victoria Falls. 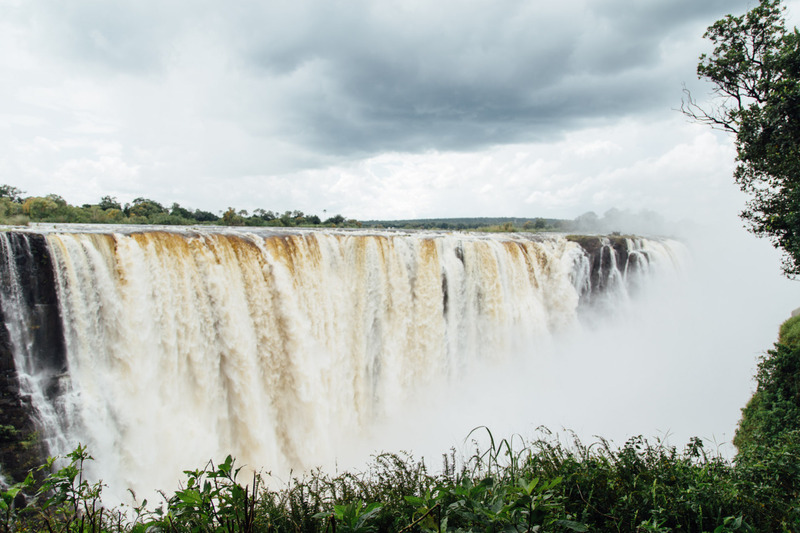 Part of me wishes I could say there was a fabulous story packed with adventure and mishap that led to our arrival in the Falls, but our driver Luke, quiet and matter-of-fact, delivered us speedily and right on schedule. 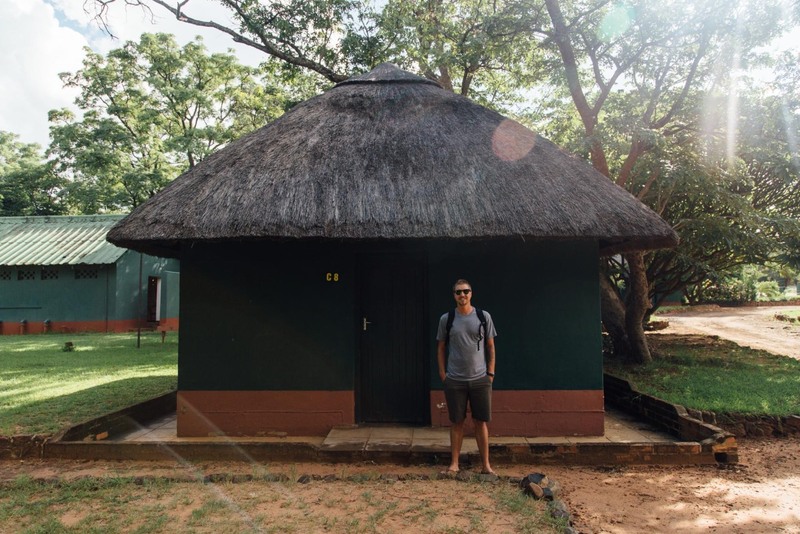 As soon as we arrived at the Victoria Falls Rest Camp, our humble accommodations for the first three nights of our stay, the skies opened up and the rain began to fall. I had made a booking for a small canvas tent, complete with beds and linens for the price of $40/night. As Chris and I lugged our backpacks to Tent 12 and wrestled with the padlocked zipper, the downpour escalated, and I felt the “drowned cat look” coming on. Feeling extreme culture shock from our plush accommodations in Hwange I suggested to Chris we think about upgrading to a Chalet with a REAL roof, REAL floor and REAL door. A whole $6 later, we found ourselves in a small, basic bungalow about four times the square footage as the tent option. With our lodging sorted out, Chris and I set off in search of Georgeen, Chris’s childhood neighbor who we had planned to rendezvous with in the Falls, before bringing her back to the farm. We climbed the hill to the Cresta Sprayview Hotel, passing a Warthog casually grazing in a traffic median and battling pesky street vendors along the way. We tracked down Georgeen in her hotel room, where she was resting and attempting to recover from jetlag. Over happy hour drinks we shared our respective adventures of the last few days and made plans to meet up in the following day. 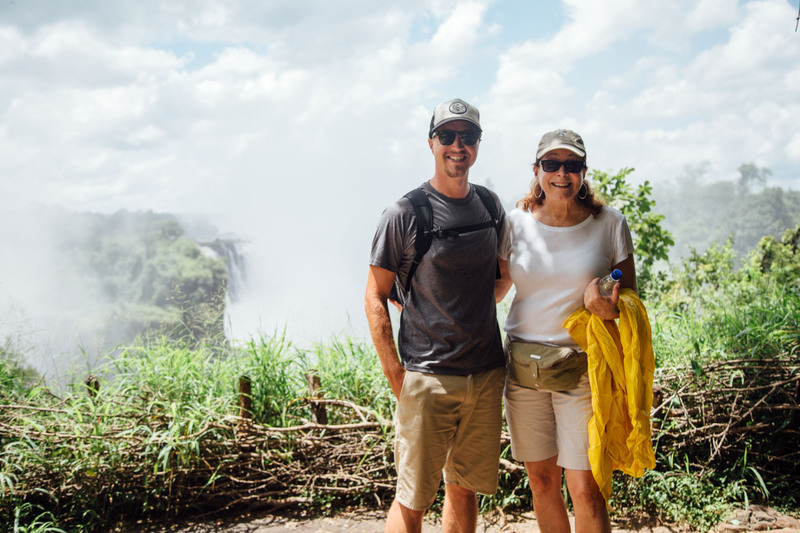 Due to the exorbitant pricing of everything in Victoria Falls, Chris and I had pinpointed a few activities that would be worth the money, the most important being white water rafting on the Zambezi River. Our first full day we rose at 6, in preparation to meet our rafting group at 7:10. 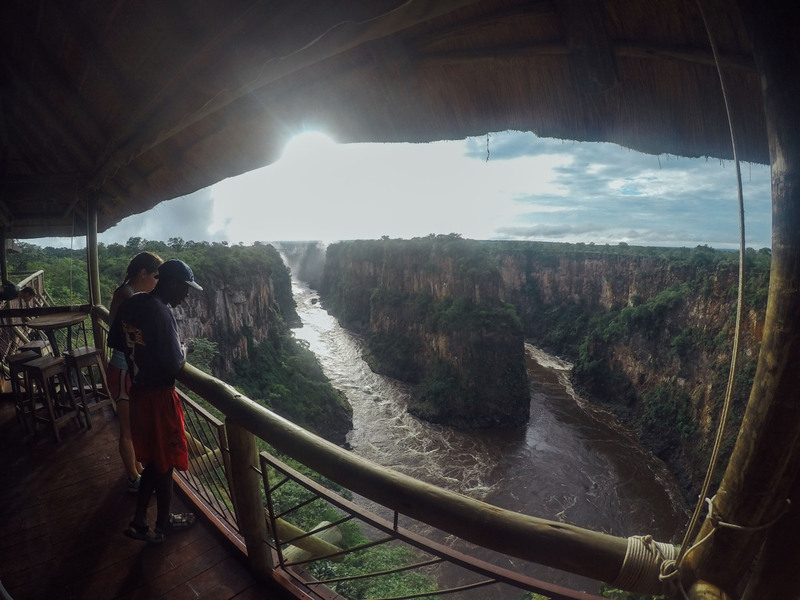 They took us to “The Lookout” a restaurant over-looking a stunning horseshoe bend in the river just below the Victoria Falls Bridge. It was there that we had our safety briefing and trip overview. There were only six of us clients this particular day; a young Aussie couple, a retired British couple and us. I think we had all the makings for a fantastic joke. Our guide, who went by “Colgate” ushered us to the vehicle that would take us to our put-in location. 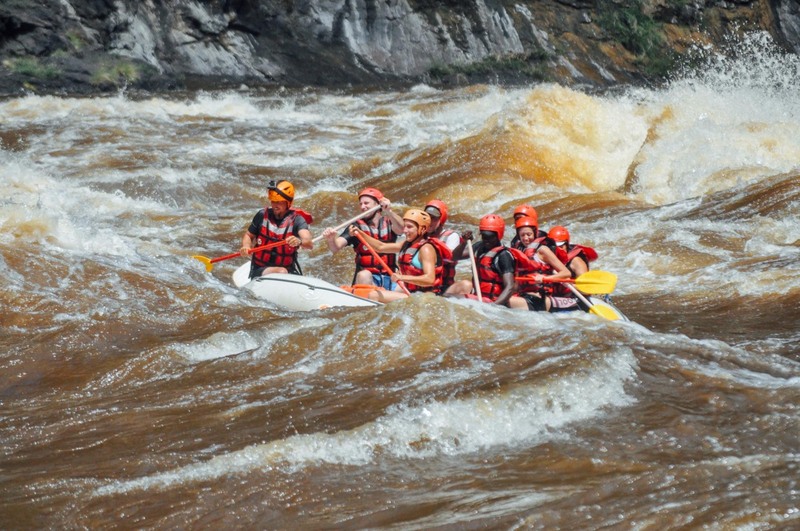 Due to fact that it is the high water season, we would only be able to raft rapids 11-23, as the earlier ones are overrun with whirlpools and impassable sections. We knew it would be an adventure nevertheless. What they don’t tell you when you are booking your rafting trip is that the hike down into and out of the gorge requires double the amount of energy than the rafting itself. By the time we got to our boat, my quads were burning and we were all sweating profusely, unable to breathe in our tightly cinched life jackets. After some paddle practice we were all thoroughly spent. 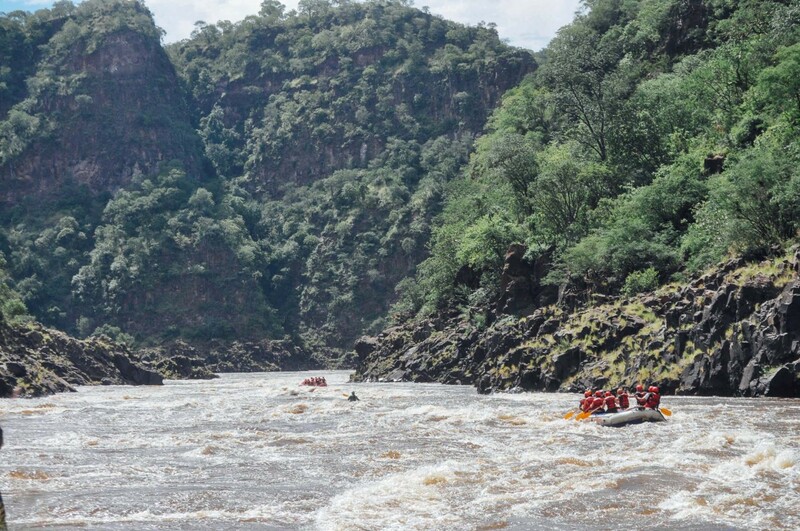 Fortunately, the adrenaline rush that comes with rafting rapids kicked us back in gear, and once we started heading down the river, our energy was revitalized. In the moments between the rapids, we had a chance to take in the dramatic view from the bottom of the gorge, the walls laced with greenery due to the rain. Colgate gave us the opportunity to float alongside the raft in a few sections, and the river was the most idyllic temperature. Before we knew it we had reached our exit point, Go Pro still intact, and a daunting climb out of the gorge ahead of us. In 20 minutes Chris and I managed to climb 1000+ ft from the river bank to the location where lunch awaited us, though by the time we arrived at our destination all we wanted to do was collapse. We took some time to recover and rewarded ourselves with some drinks and a hefty pile of food. The following day I woke up with the satisfying full body ache that meant I got a work out the day before. We enjoyed a simple breakfast at our beloved Rest Camp and headed out to meet up with Georgeen and tour the Falls with her. We were warned to waterproof everything with us, as the Falls are massive this time of year, and getting drenched was guaranteed. 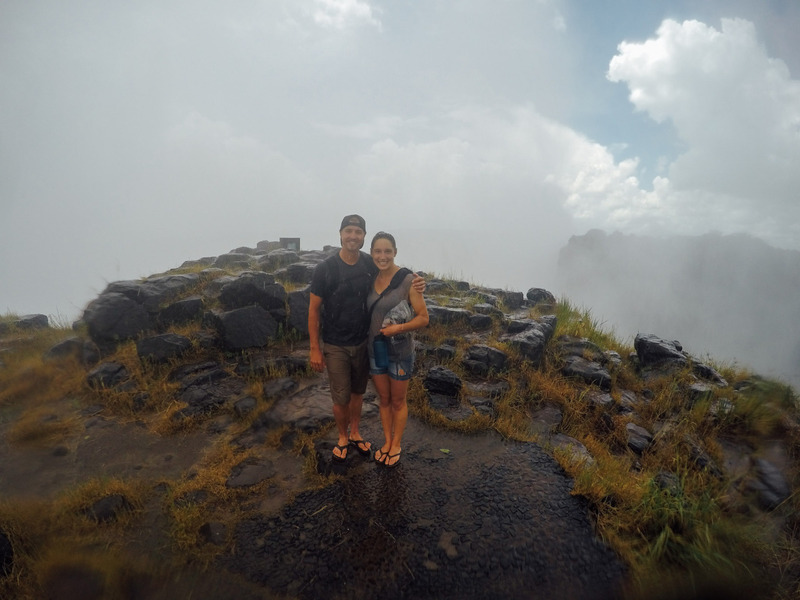 After paying our entry fee we strolled from view point to view point, feeling increasing amounts of spray as we got closer to the main cataracts. Eventually I sequestered my camera in a large Ziploc bag and the Go Pro became the method of documentation. No sooner had I done that, and my clothes were soaked through with waterfall mist. There came a point where we were unable to discern if we were being rained on or sprayed on. With our visibility diminishing we kept our eyes focused on Georgeen, leading the way in a duckling-esque massive yellow poncho. 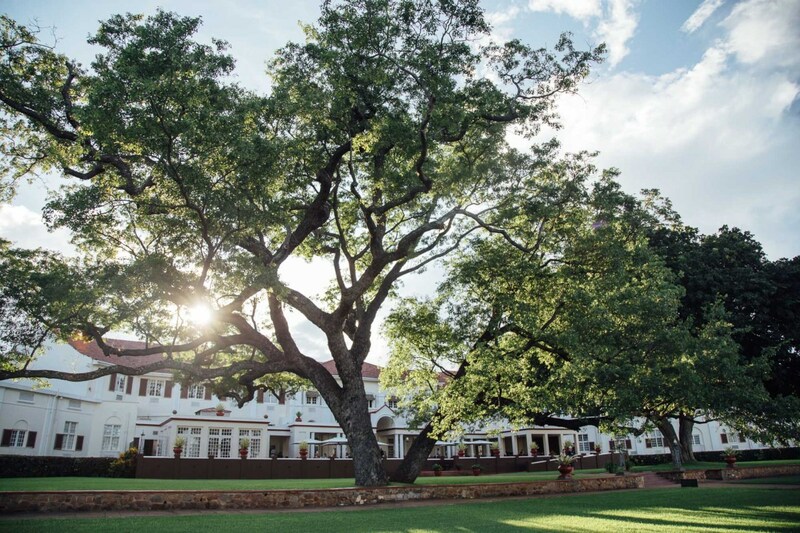 Having done the “must–dos” in Victoria Falls, like eat at the Boma, and stroll through the Victoria Falls Hotel, we spent our last day in pure relaxation. We had decided to book at the Ilala Lodge for our final night, in honor of Chris’s birthday on the 16th. Given the splurge it seemed only right to spend the entire day there making the most of their pool and amenities, preparing for our return back to farm life. 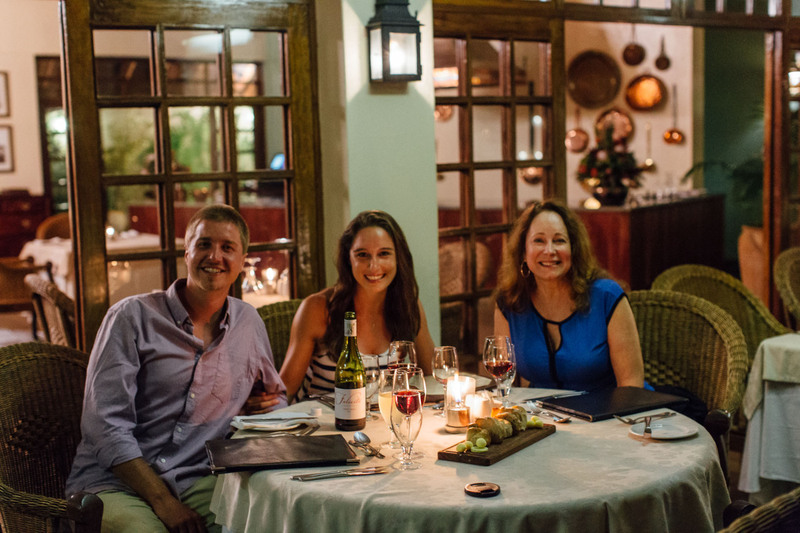 We enjoyed an exquisite birthday dinner that evening, courtesy of my parents! At 7 am the following morning the three of us were boarding the Pathfinder bus to take us the 5 hours back to Bulawayo where we would reunite with Chris and Norma. It had been a stunning week and just what the doctor ordered after five weeks of farm sitting, but we were eager to return to the Matopos where projects, friends and more adventure were waiting.